Though the book of Revelation was penned by the hand of the Apostle John, it is claimed that these letters emanate directly from the lips of the ascended and glorified Jesus Christ. Stott notes that “in them, by praise and censure, warning and exhortation, He makes plain much of His will for His people. The seven churches of Asia, though historical, represent the local churches of all ages and of all lands”. The onslaught on the Church was physical through a persecuting emperor and his deputies, intellectual through false cults, and moral through sub-Christian ethical standards. As we look around the world today, the same pressures are harassing different churches and the messages in these letters are also for the Church in the world. Stott says “it’s a call to Christians to endure tribulation, to hold fast to the truth, to resist the deceptions of the devil and to obey the commandments of God.” In each of the seven letters, which follow, the risen Christ lays emphasis, either in rebuke or in commendation, of one particular characteristic of an ideal church. Put together, these characteristics constitute the seven marks of a true and living church. 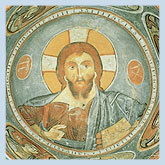 The Letter to Ephesus urges Christians to return to a love for Christ (Rev. 2:3-4 “You have left your first love”). The Apostle Paul spent two and a half years here on his 3rd missionary journey, and in Acts 19, a riot broke out over the drop in sales of the silver models of Diana’s temple. According to an early tradition John replaced Timothy towards the end of the first century as leader of the Ephesian church, and probably wrote his first epistle for them. The excavations done by Austrians are considered to be the largest excavated ruins in the world. The Letter to Smyrna encourages followers to have a willingness to suffer for Christ (Rev. 2: 10 “Do not fear what you are about to suffer”). Smyrna is now the modern city of Izmir, known in history as the “Pearl of the Aegean”, and is located about 35 miles north of Ephesus. If the first mark of a true and living church is love, the second is suffering, for a willingness to suffer proves the genuineness of love. Polycarp, the bishop of Smyrna in the 2nd century, proved his love when he was martyred here. Izmir (Smyrna) is the only one of the seven that has had continuous Christian congregations meeting within the city. In the Letter to Pergamum, Christ commends the church in regards to holding to the truth (Rev. 2:12-13 “You hold fast My name, and did not deny My faith”), but then reproves them for tolerating some false prophets. “The seat of Satan” (2:13) may refer to this city being a strong center of paganism with many temples on top of the fortified hill known as an Acropolis. Because of the strong worship of Asklepios, the god of healing, it became a center of medicine. The modem excavations of these places are quite impressive. The Letter to Thyatira gives emphasis to a holiness of life (Rev.2:19-20 “I have this against you, that you tolerate the woman Jezebel “). It was the smallest of the seven cities and was a garrison city used to deter enemies from reaching Pergamum, 40 miles to the northwest. It was a prosperous trading center and the writer knew of the bronze worker guilds there when he wrote “These are the words of the Son of God, whose feet are like burnished bronze” (2:18). Stott tells us that “while the church manifested love and faith, service and endurance, there was moral compromise, a lack of righteousness of character”. The Letter to Sardis emphasizes the need for inward reality behind the church’s outward show (Rev. 3:1 “You have the name of being alive, and you are dead”). Sardis was the converging point of several inland roads situated in a fertile valley at the foot of Mount Tmolus. However, its ancient history was more distinguished than its modern. Once a splendid and wealthy city, but after severe defeats, it fell greatly. Its religious history, like its civil, belonged to the past. The ruins unearthed give a glimpse of the city’s beautiful past that is now dead. The Letter to Laodicea emphasizes a wholeheartedness in everything (Rev. 3:15-16 “You are lukewarm, and neither hot nor cold”). About forty miles southeast of Philadelphia, there are three famous cities clustered in a valley. 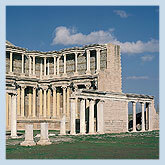 Hierapolis stood on the north of the river, while on the south bank were Laodicea and Colossae. Its beginnings and past are not clear but Christ sends to this church the sternest of the seven letters. There’s no mention of heretics or persecutions, simply that they were “neither hot nor cold”. The hot springs of Hierapolis become lukewarm by the time they reach Laodicea. Perhaps none of the seven letters is more appropriate to the modern Church than this one. So as you can see, when a visitor comes to these remarkable Roman ruins carrying his New Testament and reflects on what happened in the past and meditates on the universal lessons to be learned today, a trip to the Seven Churches of Revelation in modem Turkey can be an unforgettable experience. Turkey, with its thousands of ancient sites reflecting its centuries of history and culture spanning more than 5000 years combined with its modem beauty, sunny beaches, crystal-clear waters, exotic bazaars, world-renowned cuisine, and hospitable people, is a destination guaranteed to be a life-changing trip.